Fall cankerworm (Alsophila pometaria) is one of those insects that is more of a nuisance than a real pest. However, if you have ever found yourself walking under a tree in the early spring with little inchworms dangling from a silken thread that kept bumping into you or landing on your head, then you would say they are more of a pest than a nuisance. Calls about this inchworm usually occur in April or May when they are leaving the tree to pupate in the soil. However, the best time to control this little worm is in the fall when the wingless moth emerges from its cocoon in the soil to crawl up the trunk of the tree to lay its eggs. Because the moth is wingless, if you had caterpillars last spring, it’s a good bet you will have them again next spring. If you are one of the many people who like to use little or no chemicals to control pests, then you are in luck. One of the easiest and best ways to control this particular insect is to put a sticky barrier strip on the trunk of the tree. To do this you will want to wrap a little insulation or cotton quilt batting about 12 inches wide around the trunk of the tree. Cover the batting with a strip of roofing felt or heavy packaging paper⎯the type you would use to wrap a package to be shipped in the mail. On large trees with rough bark, short staples can be used to hold this in place. 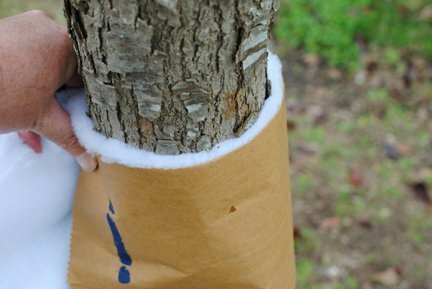 For trees with thin or smooth bark, electrical tape can be used to hold the wrap in place. Then paint a sticky substance like Tanglefoot on the paper. This should be kept sticky and free of debris from about mid-November through the end of December. For spring cankerworm, the sticky strip should be applied February through March. As the wingless moth emerges and tries to crawl up the tree it will stick to the strip and be unable to lay eggs in the top of the tree. 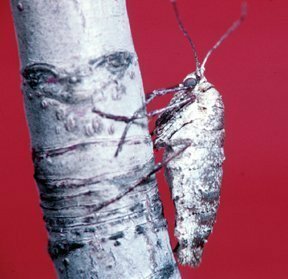 If you miss the opportunity to control the wingless adults, but would like to keep these dangling insects from being a distraction as you enjoy the spring weather, products containing Bacillus thuringiensis such as WormWhipper, DiPel, Thuricide, or one of the many others that are available can be sprayed. Organic growers have used this naturally occurring bacterium for many years to control caterpillars. These products have no detrimental effects on beneficial insects. They cause the caterpillars to stop feeding and eventually die. Most homeowners can safely spray small trees in the landscape, but may need to hire a professional to spray larger trees. For more information on fall cankerworm, contact your local Cooperative Extension office. Cankerworm photo by James B. Hanson, USDA Forest Service, Bugwood.org. Tree wrap photo by Shawn Banks.